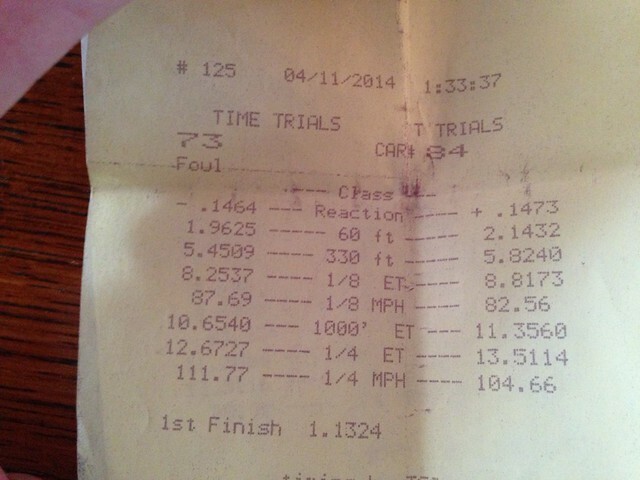 16AUG13 @ MIR: 12.814 @ 106.36, with a 1.75 60' and backed it up with a 12.954, 1.855 60' @ 106.52mph. 2014 GT Track Pack. This is my first manual transmission car. I picked up the Mustang about 3 weeks ago now, and I've since done about 10 passes at LVMS. My best time was 13.660 @ 105.41. It was 93 degrees out when I took that pass. I'm looking to improve my 60ft time of 2.228. I launched at 3500rpm, but I get nervous and release the clutch too fast. I know I need to slip the clutch more. Also all 4 tires were at 35psi. Any tips on getting faster 60's and ET's? The increased rollout on 28" ET fronts in theory should reduce my 60' and overall ET. With my low power car, I'm looking for any advantage I can get. What's a good ET for a 2010 GT w/ track-pack. Recently bought one used and going out to Gainesville's track for the first, just interested in what I should be aiming for or expect.